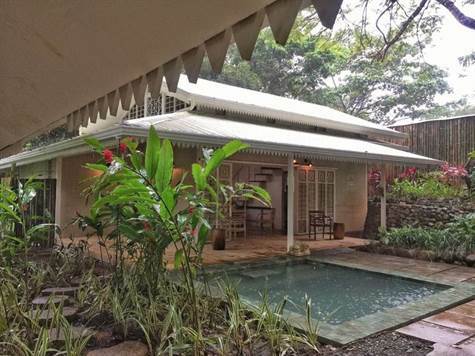 Brand new construction located in at the top of the hill in central Manuel Antonio. You can walk to transportation, shops, dining, and local amenities. This home is has 2 bedrooms, loft and guest home with 2 bathrooms. Note the awesome bathroom in the photos. Large soaking tub and grand bathroom. The home is surrounded by bamboo and amazing gardens. The home is decorated with imports from Bali and has many luxury features features. Stone tile pool, outdoor shower, pass through window in the kitchen, grand doors that open to the pool and entrance. This home has been finished with natural elements and luxury finishes.